Born in Erie, Pennsylvania, Peat attended Ohio Wesleyan University. She founded an interior-decorating studio with her husband, where she specialized in designing material for children, including textiles, wallpaper, and murals. Peat illustrated several books for Samuel Lowe and Saalfield Publishing Company. Among the better known was an edition of Robert Louis Stevenson's A Child's Garden of Verses, for Saalfield. Several pages are shown here. Peat also illustrated an edition of Little Black Sambo for American Crayon Co. and Harter Publishing in 1931. From 1935 into the 50s, FBP served as the art director for Children’s Playmate magazine, and produced every one of the publication's colorful covers–at least each cover I have seen, which number in the dozens. During these years her work ended up in all manner of ephemera: paper doll collections, story illustrations, cut-out toys, and the like. I have been lucky to get sustained engagement with extant issues of Children's Playmate, by securing several dozen issues on eBay. These yield a somewhat fuller picture, if less of Peat's biography than of illustrated matter for American kids in the late 30s and 40s. The magazine bears more than a passing resemblance to Jack and Jill, a Curtis Publishing entry that began publication in 1938. Jack and Jill seems to have been a knockoff, albeit one with higher production values. Like Childrens' Playmate, Jack and Jill featured a center spread activity page, which often involved production of paper dolls. Several examples of FBP's doll cutout pages appear below. Fern Bisel Peat, Children's Playmate cover illustration. August 1938. Published by A.R. Mueller Printing Co, Cleveland, Ohio. More Children's Playmate covers and interior spreads appear below. The magazine was the most durable engagement of Peat's long career. Fern Bisel Peat, Children's Playmate cover illustration. February 1952. Published by A.R. Mueller Printing Co, Cleveland, Ohio. 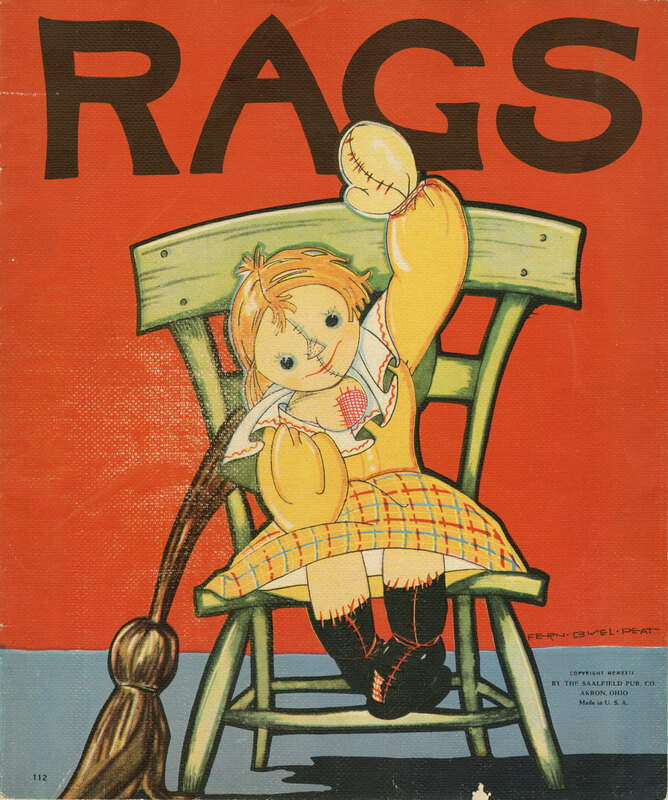 Fern Bisel Peat, cover illustration for Rags. Published by Saalfield Publishing Company in 1929. In a sort of proto-Toy Story tale, the doll Rags interacts with other toys and playthings. The stitchery on her face falls short of charmingly handmade, and feels a bit Frankensteinian. Fern Bisel Peat, Rags. Published by Saalfield Publishing Company in 1929. Note several regrettable visual tropes born of a children-of-the-world conceit; a yellow-skinned "oriental" doll in Rags' right arm, and an African-American "pickaninny" doll in her left. The baby in the carriage has been replaced by a monkey. All told the Rags project, which I picked up at an antique shop in St. Louis, is fairly creepy. Fern Bisel Peat, Rags. Published by Saalfield Publishing Company in 1929. Fern Bisel Peat, book illustration in Rags. Published by Saalfield Publishing Company in 1929. Fern Bisel Peat, Children's Playmate cover illustration. July 1948. Fern Bisel Peat, Playmate cover illustration. August 1948. Fern Bisel Peat, Playmate cover. March 1939. Fern Bisel Peat, paper cutout illustrations, Playmate. March 1939. Fern Bisel Peat, paper cutout illustrations, Playmate. July 1948. Fern Bisel Peat, paper cutout illustrations, Playmate. November 1948. Fern Bisel Peat, cover illustration for Child's Garden of Verses by Robert Louis Stevenson. Published by Saalfield Publishing Company in 1940. Fern Bisel Peat, Child's Garden of Verses by Robert Louis Stevenson. Published by Saalfield Publishing Company in 1940.